+ Can Aeroseal fix my hot or cold rooms? + Can Aeroseal reduce the amount of dust in my home? Ductwork runs through attics, crawlspaces, basements, garages, and walls. Leaking return air ducts pull in dust and other indoor air pollutants and sends them to the central heating and cooling system. From there they are sent to the living areas of your home. The Aeroseal air duct sealing system can reduce the amount of leakage by as much as 90%, reducing dust and other indoor air pollutants from the conditioned air in your home. + How much will Aeroseal save me in energy costs? Some homeowners have saved up to 40% on their energy bill. Naturally, exact savings are difficult to precisely estimate since they depend on a multitude of variables such as your weather, house condition and design, your heating and air conditioning system, system usage – as well as other factors like energy prices. + What does the Air Duct Diagnostic and Inspection tell me? Inspection discovers any obvious break in the duct work and, as the initial step of the sealing process, the Aeroseal system will establish an exact amount of leakage in the duct system. Of course, many people already know that a room or two in their house doesn’t get good air circulation because they can feel it. Or, they already know that their energy bill is high because they see it. The diagnostic measurement, provides a scientifically valid means to understand the performance of your air duct system. Many people are surprised to learn that homes typically leak 30% to 40% or more of their air through air duct leaks. + How long does Aeroseal last? + Will my house smell after Aeroseal? + Is the sealant used in Aeroseal safe? + How long does it take for Aeroseal to dry? It only takes around 2 hours for Aeroseal sealant to dry. + What VOCs are emitted by Aeroseal? The sealant used by Aeroseal has been tested by an independent lab and found to have extremely low concentration of VOC’s during sealing time. The primary component has NO OSHA maximum exposure limit. + Should I be in the house during the Aeroseal application? + How big of a leak will Aeroseal seal? Up to a 5/8th-inch round hole can be sealed by Aeroseal. + What about leaks that are too big? + Where does the sealant leaking from the ductwork go? + Does Aeroseal harm electronics? + Do ducts need to be cleaned prior to sealing? During your estimate our technician will assess the condition of ducts. Extremely dirty ducts should be cleaned. + Can I clean my ducts if they are sealed by Aeroseal? Most customers find that once their ducts have been sealed by the Aeroseal process there is not a need to clean the ducts again for some time. But yes, ducts of all material types can be successfully cleaned after they have been sealed with Aeroseal. + Will the insides of my ductwork be covered with sealant after Aeroseal? 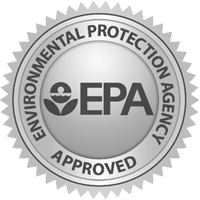 Aeroseal® is commissioned by the U.S. Department of Energy and EPA approved.